TravelSkite: People and places. But mainly people. So, here we are on the last day of the year - again! - and it's time, apparently, to review 2014. As I write, bodies are being retrieved from the sea after the Air Asia crash, so it's tempting to conclude that it hasn't been a great year for air travel, what with Malaysia Airline's two ill-fated jets plus a scattering of small-plane crashes over the last week. Of course, horrific as all those are, you're still safer in a plane than driving to the airport. Certainly, in all the long-haul flights I did this year, there wasn't a moment of disquiet, not one. But I'm not going to list them all, or count the different airlines, or countries, or modes of transport (helicopters! horse!) or hotels I stayed in, or thousands of photos taken, or even the number of trips I went on (or, "holidays" unquote, tch). Not tonight, anyway. Instead I'm going to remember some of the people I met, all different nationalities and ages but who all had - have - in common a wonderful enthusiasm and positiveness, and an eagerness to share. There was Suree, best guide ever, in Thailand - funny, patient, interesting, interested, knowledgeable, professional and honest. She was the very best bit about my famil to Bangkok and points north, and I especially admired her passion for her country and her eagerness that we should understand that Thailand is safe, and welcoming, and beautiful and fascinating. She was in tears at the end, as she said goodbye to us, urging us to pass on the message that Thailand is open and waiting for visitors. I really liked Tehei too, at Taoahere Beach House on Moorea in Thailand, who was so motherly and hospitable, and took pity on me up in the honeymoon villa all on my own, and brought me meals and flowers and baskets of bread, and invited me for a family dinner with her children to eat poisson cru she'd prepared herself, which we ate alongside the lagoon, with fish jumping in the dark. Then there was Dan, our guide in northern Australia, who looked like your typical Territorian: khaki shorts, stout boots, hat, tanned, a bit rough round the edges maybe - but he was lyrical about Kakadu, and so respectful of Aboriginal culture, and clearly in love with the land. Also, he had a most unexpected imagination, that kept him amused on long drives when all his passengers had fallen asleep, and in his head wrote screenplays for movies which he was keen to share in generous detail. I honestly hope Drop Bear: the Movie gets made - sounds like a classic. There's no way I could ever forget Sean, at the Lindisfarne Hotel on that island, who thought he was so funny, which made him funny, but not how he intended, not that he'll ever know. He had a routine, you see, a set piece full of jokes that he trotted out as each roomful of guests turned up for breakfast, without ever being hampered by the fact that the previous audience was still sitting there, listening to it again. And again. But he threw himself into it so enthusiastically that it felt mean, to criticise. 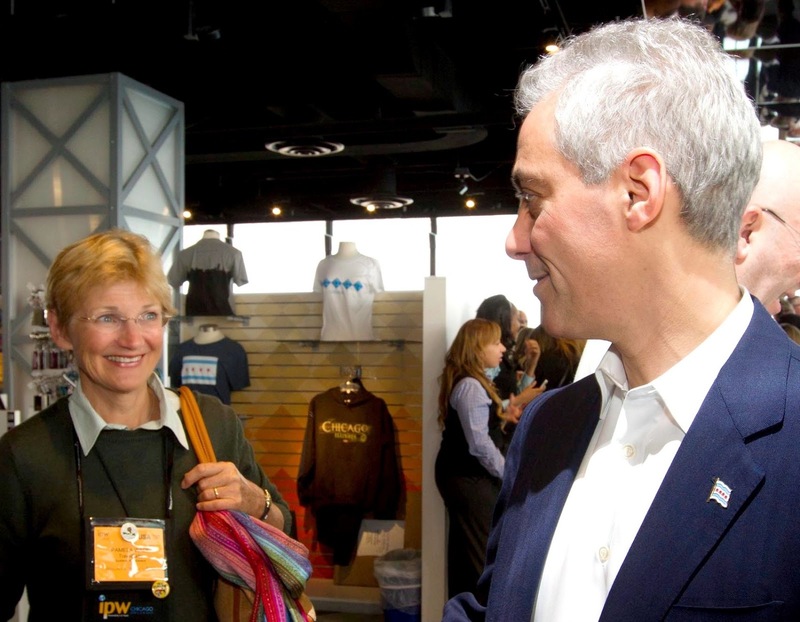 On my first trip to the US this year, I met Rahm Emanuel, the mayor of Chicago. Well, I shook his hand at a tourism do that was all about schmoozing as he worked the room full of travel writers and tourism promoters. He was keen, I'll give him that. We were up on the Observatory of the Hancock Tower, with fabulous views on a sunny day out over the lake and city, and down to the welcome sand sculpture on the beach 94 storeys below. The second time I went to the States, it was Jerry from Georgia, elderly and bald as a coot but full of life, who made the strongest impression. He was another passenger on the Silver Whisper cruise from Boston to Montreal, and a stalwart of our Trivial Pursuit team. At the end of each day's competition, he gave me his share of the place-getter's tokens, and he was olde-worldly flattering and complimentary, which was sweet. Excellent lesson in not writing off old people as just, well, old. So much more than that! Down in Queenstown - or Glenorchy, more accurately - it was Kate and Matt, and his father Laurence who charmed me with their friendly enthusiasm and eagerness to share this particularly beautiful bit of New Zealand with the people on their bike tour. Even I, who hadn't been on a bike for years, felt inspired and capable, and with their encouragement not only kept pedalling along the far shore of Lake Wakatipu, but actually enjoyed it. And Laurence's dinner at the (sadly now burnt down) Paradise Lodge was genuinely 5-star. In Scotland it was two people: John and Paul, who run 94DR which is a classy and comfortable B&B in Edinburgh. They were indefatigably cheerful and enthusiastic, full of suggestions for how to spend our time in the city, and effortlessly welcoming. Breakfast there was as much of a show as at Lindisfarne, but genuinely fun and really delicious: raspberry and rhubarb compote, homemade granola, porridge made (of course) the proper way with salt in it, avocado and bacon bagel... Yum. And Molly the dog was friendly too. At the World Youth Rhino Conference at iMfolosi in KZN in South Africa, there were lots of inspiring people, most notably Dr Ian Player, then very frail and alas now no longer with us, a giant in conservation and a figure accorded the greatest respect by everyone there. But I'd like to pick Trang Nguyen, a young Vietnamese woman who got caught up almost by chance in conservation, bore the burden nobly of representing one of the two nations behind most poaching, and has achieved tremendous things back home in educating the public and spreading the word. She is a marvel. So many other countries, so many other people - it was a very busy year - but I want to finish with a guy I never even spoke to. Just some random dude relaxing above a waterfall at Gunlom in Kakadu, he provided the perfect focal point for my favourite photo of all of the thousands I took in 2014. Thanks for coming along for the ride. See you next year?